If we have a look at the films which were being produced in Spain at the time, we might be at first deceived by a few examples of what has been called (Franco’s) ‘Regime Cinema’ – el cine del Régimen – a series of purely entertaining works that not only avoided tackling the country’s sociopolitical situation but also encouraged escapism (El último cuplé, Tómbola, El pequeño ruiseñor…). If we have a deeper look though, we can see how other not so widely known films dared to challenge the Spanish Establishment of the time. Calle Mayor, written and directed by openly communist director Juan Antonio Bardem is a clear example of this more subversive cinema. The film starts with an overview of a town. An anonymous narrator tells us this is just a normal town, like there are many others. We follow the camera’s movement until it reaches the ‘calle Mayor’ – the town’s main street. We are introduced to Juan and his friends, who belong to the local middle class. In order to mitigate the boredom produced by the lack of amenities they drink, sing and plot distasteful pranks against other fellow citizens. 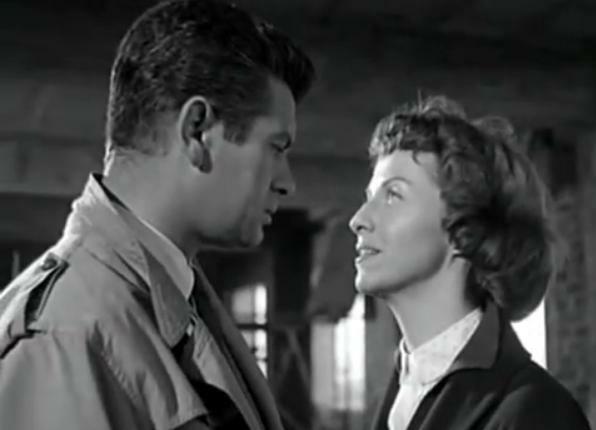 The group targets sanctimonious spinster Isabel (Betsy Blair) as their next victim. Juan is then challenged to seduce naïve Isabel whose only hope in life is to get married. Isabel falls in love with Juan with a melodramatic passion which seems more appropriate for a teenage girl than a thirty-five year old woman. Realising at one point that the joke has gone too far, Juan turns to his friend Federico (Yves Massard) who wisely advises him to confess the truth to Isabel. Juan is then morally forced to make a decision whose consequences will turn everyone’s lives upside down. Calle Mayor is a highly influential film still today. Based on the play La señorita de Trévelez by Carlos Arniches, it offers a very bleak vision of provincial society in Spain during Franco’s rule. We helplessly witness Juan and Isabel’s inevitable downfall and eventual social alienation. Meanwhile, the cruel and cunning pranksters never receive any punishment nor are even pointed at as guilty once in the film. They succeed somehow, and get away with it. Juan Antonio Bardem’s vision of the society of his time was grim, especially when focusing on the – back then new-born – middle classes. This vision was also shared by other Spanish film directors such as Luis García Berlanga (Plácido, 1961) and Luis Buñuel (Le Charme Discret de la bourgeoisie, 1972) who also criticised the privileged classes in their works.